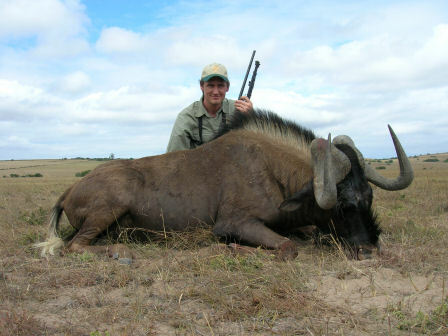 Area: we hunted different concessions from the coast near Port Alfred north to Tarkastad. 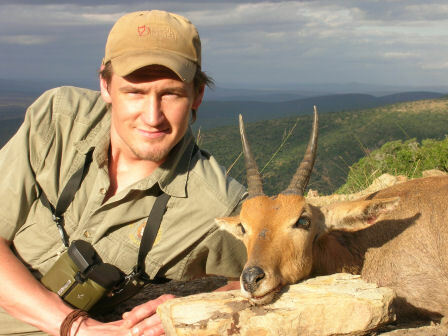 Outfitter: Safari International (Russell Lovemore of Hunts for Africa have teamed up with Larry McGillewie of Outdoor Adventures). 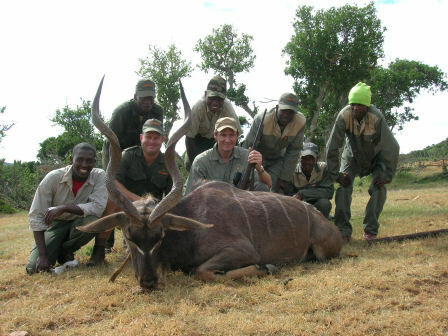 This was a great hunt with a well-run operation. My African experience is limited to three trips, but this was the best so far. Everyone involved went that extra mile to insure our satisfaction. It was a pleasure to shear these days with PH`s, trackers, skinners and camp staff. We hunted hard, 10-12 hours a day and it really paid off. 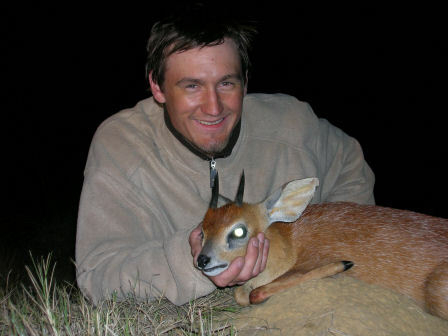 The hunt was a combination of spot and stalk, and stalking through areas Russell knew was good for certain species. We were the first clients this year, which probably meant that the animals was a bit easier to stalk. The weather was comfortable with 22-28 degrees Celsius (one or two days close to 35 which was HOT). Not much rain, but a couple of showers. 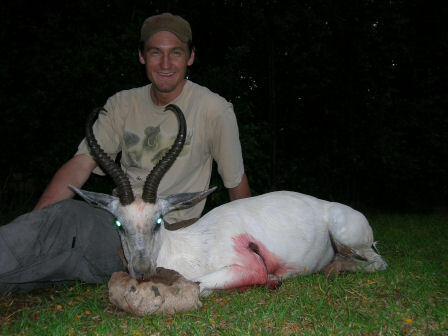 Animals taken: eastern cape kudu, cape bushbuck, cape grysbok, vaal rhebok, southern mountain. 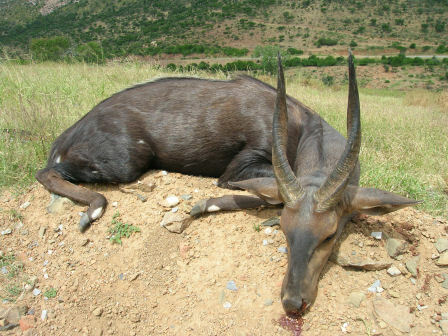 reedbuck, southern bush duiker, blue duiker, cape springbuck, black springbuck, white springbuck, black wildebeest, oribi and southern impala. Animals sought, but not taken: none. Rifle/load: Schultz & Larsen .30-06sprg., 165 Hornady Interbond. 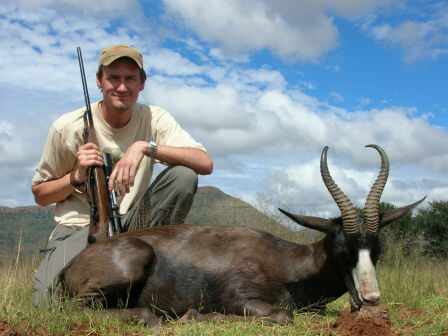 Other information: my friend Olav hunted with PH Ian Hendry and also shot 13 animals. 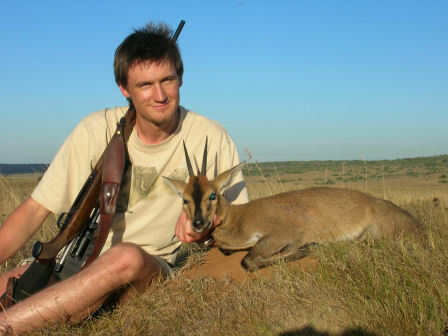 We arrived by midday on the 17th, and managed to zero our rifles and head out for a short evening hunt. We stalked to appr. 50 yards of two mt. reedbucks 500 meters from camp. I had the crosshairs on a beautiful ram, but the female was standing behind him and he moved away first. I also saw some kudu, duikers, baboon and a couple of barking bushbucks so it was very promising indeed. 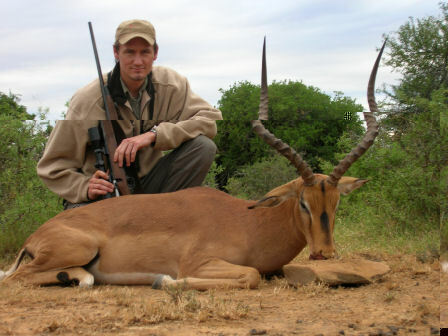 We spent most of this day looking for kudu in a good area 1 hour from the lodge. Saw 12 bulls, with 1 or 2 shooters, but couldn't close enough. 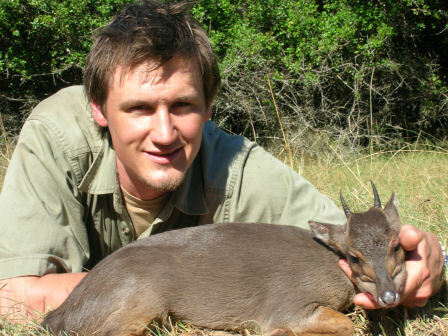 Got my chance on a common duiker, but couldn't steady my rifle for that 120-130 meter shot. This was a very hot day, around 35 degrees Celsius, especially when you're crawling around in the bush. We did try our luck after bushbuck, but only saw 1 or 2 males, but 6-7 females together so we knew they were there somewhere. 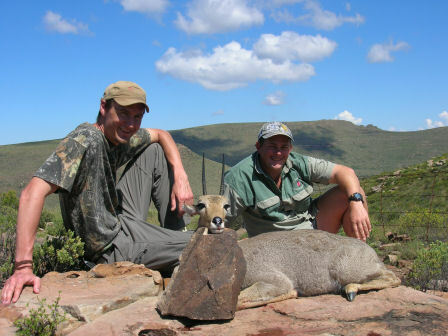 Our vaalie hunt area is close to Tarkastad, with mountains up to 7500 feet above sea level. Through the day we spot 6 different groups, but they are hard to stalk. They've got some eyes! Compare them with 15x Swarovski and you're probably close. I get my chance at 260 and 400 meters, but both shots are clean misses. Not a good feeling. There aren't many different species up in the mountains, but this is a very scenic landscape! We`re trying as hard as we can, but can`t connect with a ram. We leave the area about 13 o'clock because we're gone try for a grysbok this evening. We'll be back for the vaalie later in the hunt. Stay tuned! We saw a small spotted genet as well, but they had no permits at the moment. 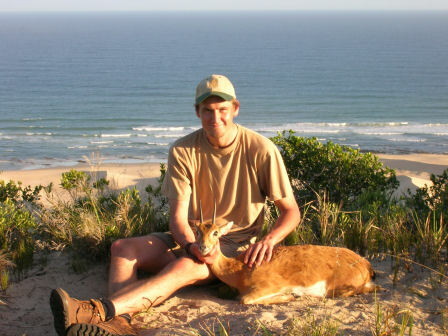 Blue duiker and oribi day! After lunch we're out looking for oribi. Hadn't actually planned to hunt these ones, but when they told me they had one license left I decided to try. There were many of them around, and I eventually got one, after missing one. I also managed to wound the one I eventually got, so the evening was a bit stressing. But, it's in the salt now! Last hunting day! 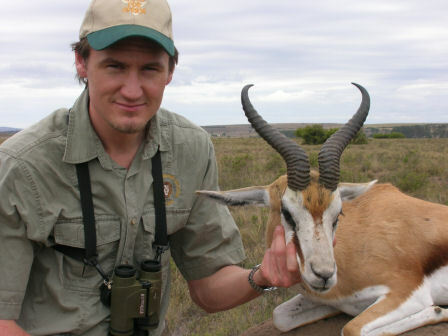 We're out a couple of hours looking for steenbok, but I'm more than happy with the hunt. And my budget is way off anyway, so I suggest we spend some relaxing time in camp, and get to measure our trophies. A GREAT HUNT! I can really recommend this outfit to anyone! Please feel free to contact me if there's anything I can do or answer. I might post some other pictures of the area, camp etc. as well, if anyone's interested.